New clean design ideal for Radiant heat applications. These manifolds are sold in pairs with both supply and return for closed loop non-potable hydronic heating systems with a maximum working temperature of 180° F. Both supply and return manifolds are provided with built in Temperature gauge in a dry well, boiler drain and air vent for easy purging of your hydronic system. *Included in price of manifold kit. 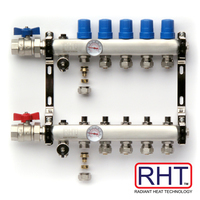 RHT SS Manifold- Temperature Gauge Dry Well Temperature Gauge Dry Well for RHT SS-HF Manifolds.